So I found this package of Gingerbread Men marshmallows at Target last week. I had no idea what to do with them but I couldn't resist buying them cause they were stinkin' cute (and like $1.25). 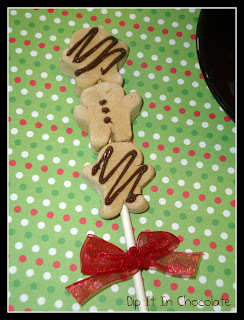 I ended up making these little hot chocolate stirring sticks for my kids. The best part is even little ones can help skewer the marshmallows. They taste alright but are nothing special. They are coated in a sugary mixture so that's why they look a little powdery. Anyway- easy peasy, and great for a snow day. Carefully skewer 4 marshmallows onto each lollipop stick. If you ruin any, feel free to eat them. Melt your chocolate in a ziploc freezer bag in the microwave, 30 seconds at a time, kneading at intervals. Snip a tip in the corner of your bag and use to drizzle across each marshmallow. Feel free to make faces. Allow to dry then package up in a little cello bag with ribbon if desired. Recipient can use as a stirring stick in their next cup of hot chocolate. So cute! I love that idea.